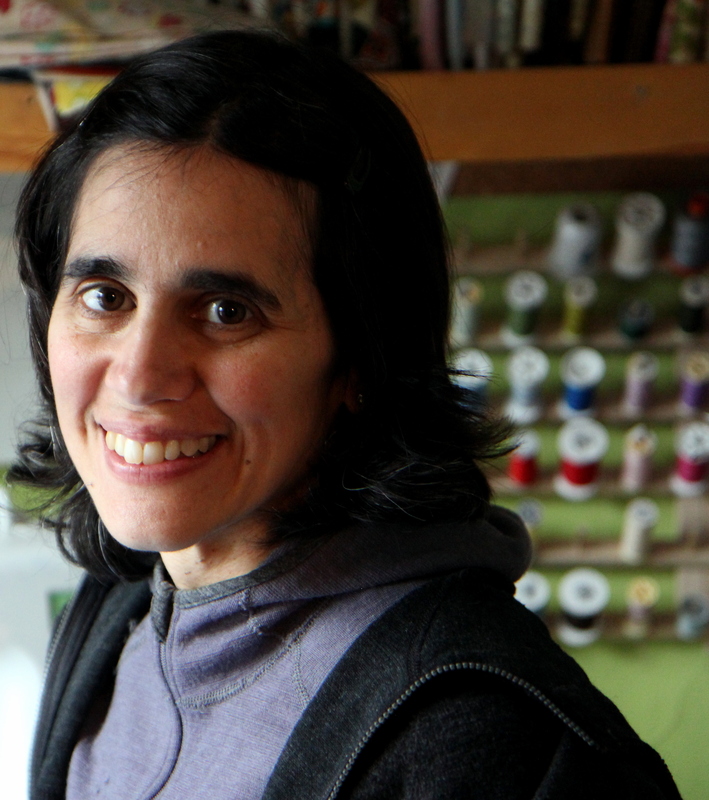 I follow a number of crafty sewing mom blogs. In them, all of the children look sparkly-eyed and the cat never sleeps on the nearly-finished bag and the photos show it all in perfect focus and bright, auto-adjusted color. Much as I learn from reading these blogs, I can start to feel defensive–or just downright sad–about the state of my own craftiness, bloggyness, and momness. I suppose I share that thought so when I share the rest of what I have to say, you will know–it is not all rainbows and unicorns around here. If you want to hear about the not-rainbows and not-unicorns, pop by with hot tea and a treat. I love to swap stories, and laughs. Tears if needed. 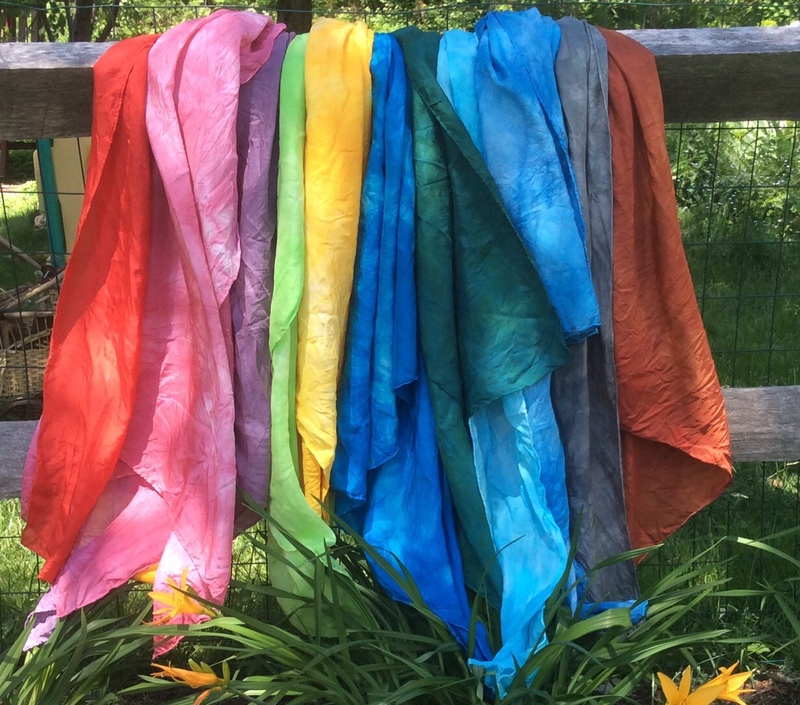 Here’s a recent project that is actually is a rainbow–a rainbow of silk! The kids and I got together with another family and had a great–if hectic–time dyeing these. We used Kool-Aid and food coloring as dye, so it was a non-toxic experience that the kids could do every step of. If you look at the grey second to the right, you will see Matty’s experiment with tearing open random packages of Kool-Aid and dumping them into the dye as quickly as possible, before mama could get across the kitchen to stop him. As Kari pointed out, it turned out just fine, but you don’t need more than one of them. I had so much fun doing this that I kept at it once the kids had moved on to something else, creating the rusty brown and dark blues. We use these just to play with, dancing around with them, using them as capes or wrapping “presents” in them. I will use them with our story table once our preschool group starts meeting again in September. They are also just lovely to have hanging in our playroom (which is a total rainbows and unicorns kind of statement, since they are hanging for about thirty seconds a day, unless you count the time when the kids are sleeping!). In outdoor craftiness, this is the first year that my gardens have had constant bloom since spring. It has been one of my dreams. The generous rains have helped, extending bloomtime and promoting some overlap, but I think also being here for six years and getting a good variety of blooming perennials, mixed in with some annuals in the windowboxes and along the edges, has helped. 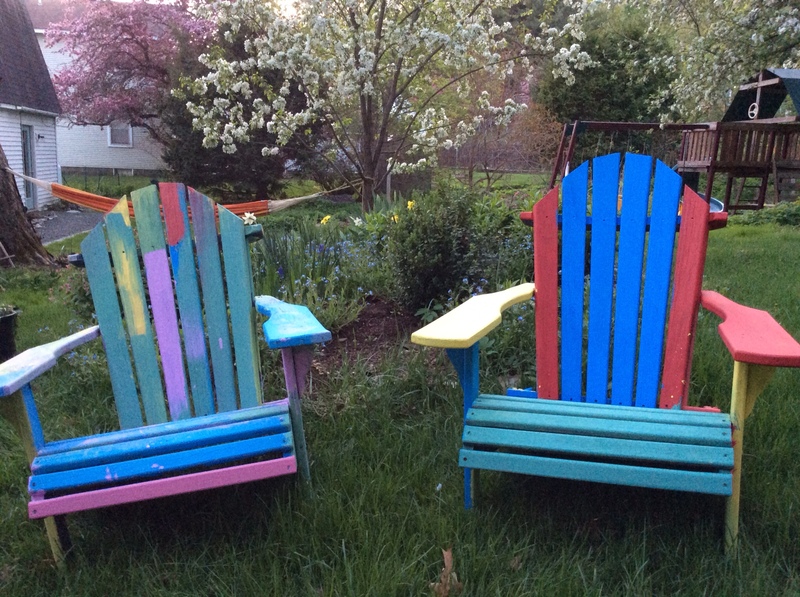 This was taken a few weeks ago, after I let the kids repaint our Adirondack chairs. They also picked the colors! It was fun (and also hectic) and these chairs were so worn that any paint was going to perk them right up. I love them, and the kids are very proud of themselves. Kevin was a bit annoyed that they kept mixing the paints, but I like the effect. Matty ended up with a pair of underwear that looks a lot like the chairs, and we had to eventually banish the children to play in the sand box, because they started painting themselves, and then each other (sigh). You can see here the first blooms of our apple trees, daffodils, and forget-me-nots. We’ve had a few lean days, but mostly between now and then we’ve had blooms around. I did find that the supposedly short daisies someone gave me last year are actually quite tall, so the echinecea and lillies behind them are shouting the flower equivalent of down in front. Some rearranging to do in that bed. Haven’t spotted any rainbows but plenty of rain. And if anyone has a unicorn that likes to graze out goutweed, send it my way! Back to sewing. Working on some goods to send down to RI for my brother to sell at Rocky Point Blueberry Farm, and some more bags, just because bags are such fun. Visiting friends and family this summer? Write me for an owl pillow or a bag to bring along as a little gift. I’m happy to ship. oh what fun, it is to sing!